A very special place of honor among the hundreds of NBA players that have come through Impact is reserved for those players who devoted themselves to Loving The Grind over the long haul. We have retired their training jerseys along the walls of our Las Vegas gym to honor these warriors for all of the blood, sweat and tears shed to make them what they became. >>Take a look inside the IMPACT gym. Six very special Impact Alumni helped Joe build what has become the world's finest basketball player development organization. The hard work put in by these men have been an example for every player that has come behind them in their journey at Impact. At IMPACT, you can train the same way and often alongside these NBA stars are making an impact on the games you are watching on TV and from the stands every night. Impact is proud to have played a key role in the careers of these retired NBA warriors. 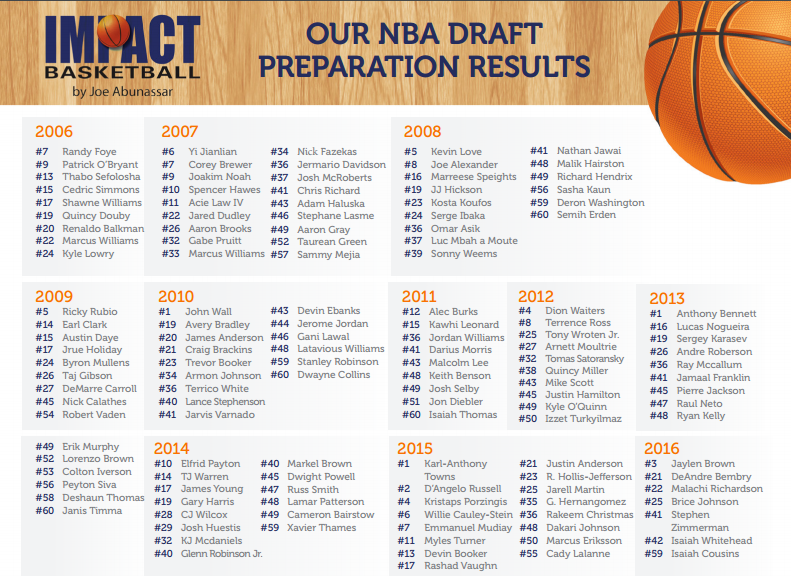 The Impact staff trained these draftees, as well as hundreds more Free Agent signees, for careers as professional basketball players. *NCAA rules started permitting potential draftees to train on campus for the first time and postpone entry into the draft.